This easy gluten free fried chicken recipe is seriously the best ever. One bite of this crispy, juicy gluten free fried chicken and you will be hooked! Learning how to eat gluten free is easy AND delicious when you have fried chicken recipes like this one. Delicious Gluten Free Fried Chicken! When the owner, Ari, of Proposition Chicken in San Francisco, told me he was going to share his exclusive gluten free fried chicken recipe with us, I thought about how incredible this was. How often do you feel safe eating fried chicken at a restaurant? It is one of those things I truly miss. What foods do you miss most after going gluten free? Comfort foods like these rarely happen in the gluten free realm, or if they do, they are rarely any good. (Looking at this photo of gluten free fried chicken is really making me hungry!) This recipe for fried chicken will bring back those memories of real crispy fried chicken. The kind your grandma made! Is there Gluten in Fried Chicken? Unfortunately, traditional fried chicken does contain gluten. Not only do they coat the chicken in flour, but the fryers in many restaurants become contaminated because they also fry other gluten foods in the fryer. What types of gluten free flour can you use to make this fried chicken? Any of these gluten free flours make great fried chicken breading. Do You Need A Fryer to Make Fried Chicken? The short answer is no, you do not need a fryer to make gluten free fried chicken. You can use a cast iron skillet like I did. I have also heard from readers that this simple gluten free fried chicken recipe works in an air fryer! How Long Do I Cook Fried Chicken In Oil? The length of time to cook gluten free fried chicken depends on whether you cook it in a frying pan, air fryer, or deep frying. You want to make sure the internal temperature of the chicken is 165F degrees when cooked. A deep fryer like this recipe calls for takes about 18 minutes. This fried chicken will take around 25 minutes to cook in an air fryer (I have yet to use an air fryer, but this is the time suggested by a reader. Cooking this fried chicken recipe in a skillet with an inch of oil will take about 25 minutes. You will need to turn the chicken often so all sides get crispy. This super easy fried chicken recipe makes chicken moist and flavorful. We hope you enjoy this recipe and can get to Proposition Chicken to try their chicken dishes out. The owner is cool and even better, this restaurant “gets” gluten free. I feel safe going here to eat their crispy fried chicken. If you love chicken recipes, give these two kid-friendly chicken dinner ideas a try! Gluten Free Asian Chicken Legs and this easy one-pan Blackberry Tarragon Baked Chicken and Rice. Tapioca flour. This fries up to make the crispiest skin. Large cast iron skillet. My favorite skillet for frying. Easy Fried Chicken Cooking Tip: Our outdoor Weber grill has a side burner attached. I use this to make my fried chicken. I hate when hot oil splatters all over my kitchen, and that hot oil smell permeates EVERYWHERE! Avoid all of this if you can and cook this outside. This is the best gluten free fried chicken recipe ever. 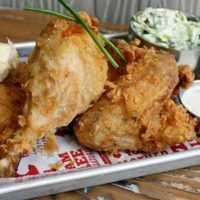 One bite of this crispy, juicy gluten free fried chicken and you will be hooked! Put all ingredients (except chicken) into a container and whisk until fluffy. In a large dish, pour marinade over butchered chicken. Move chicken around to make sure it is all covered in marinade. Drain marinaded chicken in a large strainer. Place chicken in the tapioca flour and move it around to cover the whole piece of chicken. Let rest 2-3 minutes on a baking pan. Fry chicken until it has an internal temperature of 160 degrees, about 18 minutes depending on the piece of chicken. I have been frying chicken using gf jules flour mix. It does quite well and is very tasty. And my celiac husband is very happy! I have never used vinegar in my recipe…will have to try it. Sounds tasty. Better Byrd, a chicken restaurant in St. Petersburg, says they now serve only gf fried chicken and have separate fryers for the chicken and their specialty, made to order, mini donuts (not gf). We haven’t tried the chicken since they made the change to gf, but I hear good things. It is funny, I never used vinegar until the owner of Proposition Chicken gave me this recipe. I wonder if it helps tenderize the chicken. Thank you so much for stopping by Jane :-). Hi Sandi. Mouthwatering! That sounds delicious! I’m a new cooker and finding fried recipes. I’m thinking to practice this recipe. Thank you for your sharing. It works very well, I think it is suitable for chicken fried for this menu. What do you think about that? 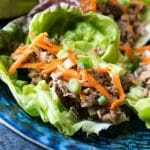 The gluten-free fried chicken recipe you are offering is great, the food is delicious and nutritious. Well I have made the delicious Paleo Apple Cinnamon Donuts, then the Banana Chunky Monkey Donuts and tonight we are having the fried Chicken & Cauliflower Cheddar Pancakes, so far they have all been great.Thanks for sharing! Hi I’m wondering if you can use an air fryer to eliminate some of the extra calories and oil? Hi Cindy, I am so sorry, I have never used an air fryer so I am not sure what to advise. I suspect it would be okay, but I haven’t tried it myself. Would you be so kind as to come back and let us know if you try it? This gluten free fried chicken looks so delicious! Perfectly cooked and that crispy coating is making my mouth water! Thank you so much Taylor…this restaurant was so cool to share the recipe with us! his looks great! My GF son will absolutely love every bite! Amazing looking crust on that chicken!! Eager to try it! Oh my gosh, I was shocked that the chicken was gluten free. It does not look like it at all. I am so excited to know I can make gluten free fried chicken for my friends to enjoy. I know it has been something they really miss. We drive to SF for this chicken…I was so excited to make it at home. I was looking for a good fried chicken recipe a few weeks ago and wasn’t pleased with the one I used. I’ll definitely be trying this one and I love that it’s gluten free. This southern girl has never been more excited! The idea of gluten-free fried chicken makes me so happy. I can’t wait to try this!!! Out of curiosity, which oil do you use? I’m thinking avocado oil but unsure if it would vibe. Hi Michele, I used avocado oil, but I suspect the restaurant uses canola. Enjoy :-). That chicken looks absolutely perfect, so crispy and moist! I wish I could reach right thru the screen and grab a piece! LOL I will have to make it for you next time you are in town. What type of oil do you use for frying?? Hi Melissa, you want to use an oil that can tolerate high heat. I like to use Avocado oil for frying. I do like some well cooked, juicy fried chicken in my life! Even though I don’t follow a gluten free diet, I’ve found I prefer gluten free breading on chicken because it’s so much crispier! That is good to know Alyssa. It has been so long since I had regular fried chicken that I forget. This looks amazing! I can’t believe the crust on the chicken. I’ll have to get some tapioca flour and make this soon! Thank you so much KC 🙂 I hope you like it. I am thrilled to find a Gluten-free recipe for chicken that looks crunchy and delish! Thanks for your recipe I won’t have to miss out on fried chicken now.Totally amped to make this. I’ve totally been missing out on fried chicken too! GF versions just aren’t as good or as crispy, but this one looks amazing! I was curious if I could make this with regular gluten free flour instead of Tapioca flour? How deep should the oil be in the pan? Is there a way to oven fry this chicken so it’s crispy but healthier and easier? Hi Su, I would say the oil should be deep enough to cover half the chicken. That way when you flip it, the other side cooks perfectly. I just tried this recipe using chicken tenders. What a treat! I was so surprised at the great tasting crispy coating, and imy tenders looked so pretty, just like your picture. Thanks for sharing! Hi Paula, I am so excited you liked this recipe!! You made my day, thank you for taking the time to write in. I am sure other readers will be excited to try this recipe out.